One of those employment barriers is incarceration. Only half of people in prison have a high school diploma or higher. So among the challenges of re-entry is finding good jobs — 65% of which require some college education. Ed Trust is working to solve the problem by advocating to lift the ban on Pell Grants for incarcerated people so they can get the education they need to reenter society. Research shows that education programs in prison reduce recidivism by 43%. DC Central Kitchen is doing its part to reduce recidivism by providing a workforce-ready program for returning citizens. Fifty percent of its staff is comprised of graduates of its Culinary Job Training program, and many of those graduates have been formerly incarcerated, battled addiction, or experienced homelessness, abuse, or other trauma. The 14-week program offers culinary arts education, career-readiness training, internships, and job placement. Their internship and employment partners include top restaurants, large hotels, fast-casual spots, hospitals, schools, and universities. According to the Food Research and Action Center, nearly 68% of students in the District are on free or reduced breakfast and lunch programs. So in addition to preparing meals for homeless shelters, rehabilitation clinics, and after-school programs, DC Central Kitchen creates healthy menus for 15 schools in Washington D.C. that serve low-income students and students of color, sourcing their ingredients from more than 30 local family farms. 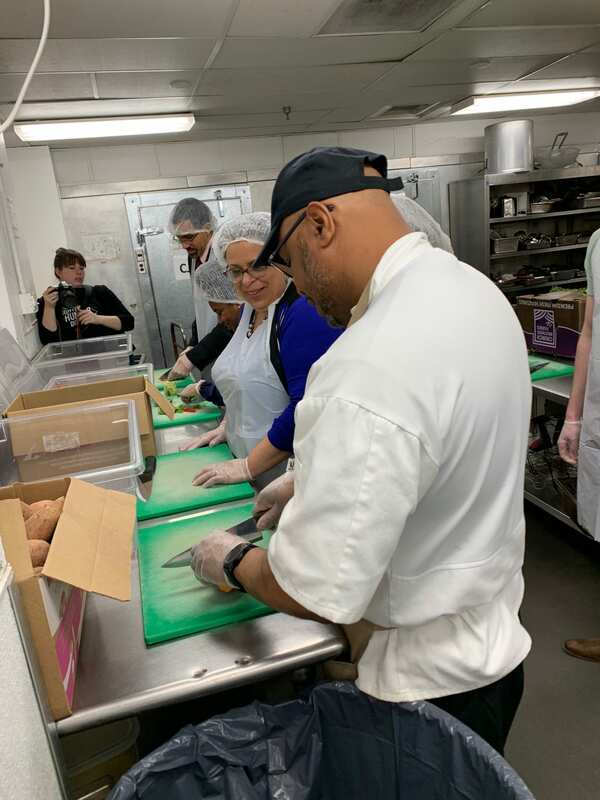 After a recent tour of the facilities, several Ed Trusters were put to work in the community kitchen to julienne sweet potatoes, dice red peppers, and mince parsley to prep for the night’s dinner menu. (There’s a three-month waiting list to become one of their 16,000 volunteers.) “We put a lot of love into our food,” said Wayne, a kitchen supervisor who’s been with the organization for four years. “We cook food that we want to eat,” he added, as a cart stacked with trays of fresh garlic-roasted baby potatoes whizzed by. Chef José Andrés described first walking into DC Central Kitchen 25 years ago: “I was expecting a run-of-the-mill soup kitchen. What I found instead was an engine of change that challenged conventions I didn’t realize needed breaking. ” His experiences there inspired him to be the great humanitarian he is today. Indeed, those of us who attended were both impressed and humbled by this multi-pronged social venture — not just because DC Central Kitchen puts food on the table for so many, but because it’s giving people the dignity of work and teaching them self-empowerment. And that’s something we all need to learn.